Africa's mining industry is leaking billions of pounds from dodgy deals and tax evasion. Change needs to happen now to ensure its commodity wealth translates into better social and economic growth ten years on. Mining industry insiders tell Heidi Vella about the challenges of doing business in Africa and what they think of changes likely to come. Africa Sector Leader for Mining & Metals at Ernst & Young South Africa, Wickus Botha. Wayne Floreani and Bruce Shapiro from Mine Africa. Iron ore mining at Thabazimbi, Limpopo, South Africa. Former UN secretary-general and Chair of the Africa Progress Panel (APP), Kofi Annan. Africa’s illicit outflows: the region loses more through such outflows than it gains in FDI and aid. Click to see an expanded version. According to the annual Africa Progress Report (APR), released in April, the continent is on the edge of enormous opportunity. As the region embarks on another decade of exploiting its resource wealth, former UN secretary-general and Chair of the Africa Progress Panel (APP), Kofi Annan, says the panel "is convinced that Africa can better manage its vast natural resource wealth to improve the lives of the region’s people." The continent has seen considerable growth in the past decade, with some areas discovering much resource wealth. Yet Africa still lags far behind much of the developed world – the APR suggests this in part is due to billions being leaked from its mining industry through tax avoidance, secret mining deals and financial transfers. "According to the annual Africa Progress Report (APR), released in April, the continent is on the edge of enormous opportunity." The report cites five under priced deals in the Democratic Republic of Congo (DRC) between 2010 and 2012, which it says were made in "highly opaque and secretive" transactions. According to the authors, these deals lost the country $1.3bn in revenues. It also refers to a review in Zambia which found that between 2005 and 2009, 500,000 copper mine workers were paying a higher rate of tax than a major multinational mining firm. Africa loses more in "illicit outflows" than it receives in aid and foreign direct investment, the report concludes. To combat this "unconscionable" practice, so that "Africans don’t go without adequate nutrition and health and education", the report lays down several recommendations, centred around improved governance and management of extractive industries, improved accountability and transparency, and improved tax laws and processes being put in place to tackle money laundering, tax avoidance and corruption. As well as calling governments to action, the report raises questions about the mining industry’s work in Africa: so how exactly do big mining companies view their duty in Africa and are they onboard with the report’s recommendations? According to political risk expert, Claude Baissac, writing in Forbes: "Africa’s growth has never been as dependent on commodities as in the past ten years." In 2010 the resource rent on mineral and fossil fuels stood at more than 20% of the region’s GDP. The continent has around 30% of the world’s total mineral reserves, including 42% of all gold and 88% of diamonds. But according to the APP report, gains from this rich resource wealth are evaporating partly due to corruption and "secret deals". "Obviously bribery and corruption and those kinds of deals take place in the mining industry, not just in Africa," says Wayne Floreani from Mine Africa, an Africa-focused business development and marketing company. It’s well known that improving accountability and transparency is the most efficient way to combat such practices, but is this something the industry is comfortable with? In the past, it has often resisted transparency measures. NGOs and industry have been talking about accountability and transparency for a long time, but now it seems the issue has finally taken hold on a global scale. Africa Sector Leader for Mining & Metals at Ernst & Young South Africa, Wickus Botha, says: "Whether they like it or not it is coming." It may already have begun. At the beginning of June, Canadian Prime Minister, Stephen Harper, announced new mandatory reporting requirements of all payments to governments from the country’s oil, gas and mining firms. A month before, France and the United Kingdom announced they will implement the Extractive Industries Transparency Initiative (EITI), the global standard for transparency of government revenues from natural resources worldwide. Botha says that companies haven’t necessarily resisted this in the past but they have felt "picked on" compared to other industries, such as the automotive industry, which isn’t under pressure to implement transparency laws. He also adds: "It takes significant investment to do all those disclosures, to monitor the information and ensure accuracy, so why should one industry do it and others not?" Bruce Shapiro, also of Mine Africa, says companies adhering to international transparency standards is beneficial to mining, as it will improve the West’s behaviour, adding that the majority of Western companies encourage it. "Companies are becoming uncomfortable dealing with governments that are not… transparent and they are now putting their money into places where the government is transparent," he says. A recent 2012 survey of mining companies from the Frazer Institute, which surveyed 742 companies from the global mining community, indicated the industry sees corruption as a turn off. Zimbabwe and the Democratic Republic of Congo were listed within the ten least attractive places to work. Around 55% of participants said they wouldn’t work in the DRC because of corruption (around 45% said it was a strong deterrent and fewer than ten percent said it was a mild deterrent). One participant anonymously described the DRC as "corrupt beyond description." Zimbabwe was 11th from the bottom of the list, with 55% also saying corruption in the country was a reason not to pursue investment there. This suggests that stamping out corruption within African Governments will not only be beneficial in terms of better sharing of resource wealth, but it may also be a key factor in encouraging Western investment in the future. In order to reduce the repatriation of mineral wealth, a key point in the APP report, Kenya last year announced that foreign mining firms will have to cede 35% of shares to Kenyans. 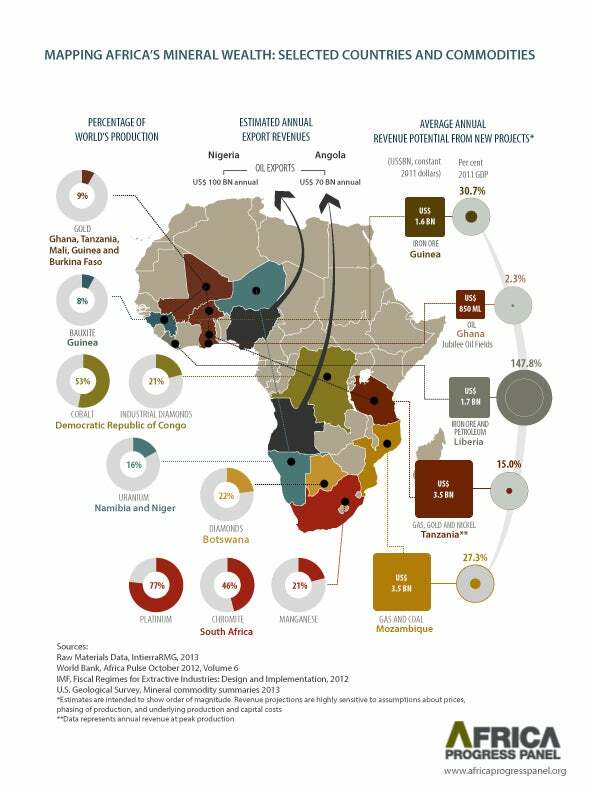 "The continent has around 30% of the world’s total mineral reserves, including 42% of all gold and 88% of diamonds." Zimbabwe also requires foreign firms to cede 51% to the state. Guinea assumes 15% ownership of all mining projects, with an option to buy another 20%. One participant in the Frazer Institute survey commenting on Africa as a whole said: "Resource nationalism in Africa is a major concern…"
So is this the right way to reduce repatriation of resource wealth, or will it simply scare companies away? Shapiro says it will scare some companies away. "51% in most countries is control. Why would a company invest hundreds of millions of dollars so that someone else can call the shots?" he says. He adds that: "The higher the percentage available to the indigenous population the harder it is for the company to operate." Botha says that when you diversify shareholders at an operational level you need to diversify management, and that slows down decision making and is one of the big problems. "Nationalisation with compensation is fine because everyone is paying their fair share," he says. Kenya seems to have acknowledged that its higher local ownership requirement is making it difficult for foreign companies, especially at the exploration stage. Monica Gichuhi, CEO of the Kenya Chamber of Mines, told an African business publication, Business Day Live, that: "It has been a very high requirement for entrants at the point of exploration, with all the risks and the costs." Earlier in June, the country’s government announced it is to revoke those terms under a new mining bill. Offshore tax havens: savvy business practice or immoral behaviour? Africa is not the only country in the world that loses tax income due to companies shifting money to offshore tax havens and offshore companies. However, Africa is, uniquely, one of the poorest regions in the world, making the practise not only tax evasion, but as Annan has previously, said: "Like taking food off the tables of the poor." Nevertheless, some think this is an unfair and unrealistic analogy. "People are not in business for the general benefit of society, they are in business to make a return on their investment," Shapiro says. "At the end of the day the company is beholden to the shareholders," he adds. Botha says that companies do not necessarily move money to evade tax, but to manage capital and cash flow of their investment. They do this to avoid very strict exchange rules in place in many African countries, which restricts money from exiting the country. "If you have done the mining and you no longer want it and plan to sell it, any cash that has been generated from the sale would be subjected to repatriation rules, they will say that you can’t take the money out of the country, which defeats the whole basis of why you are investing," says Botha. He adds that often foreign companies are forced to operate in the local currency, making them vulnerable to currency volatility. Moving money offshore reduces exposure to this. "If you could simplify the regulatory environment, and particularly the fiscal environment, that these mining companies have to operate in the need to move to offshore havens would perhaps dissolve," he says. "Africa is not the only country in the world that loses tax income due to companies shifting money to offshore tax havens and offshore companies." In the APP report, one of the key changes it says is needed in order for the continent to benefit more from its resource wealth is the processing of raw minerals in-country before being exporting. In regards to this, many have questioned the fairness of Africa’s relationship with the Chinese, who, unlike Western companies – who are interested primarily in pleasing shareholders and profits – are interested almost entirely in acquiring commodities to feed China’s growing demand. "Chinese mining companies are very focused, not necessarily on the profitability or on the share holders, they are focused on a pure access to raw materials that they want to go back in their factories," says Botha. Lamido Sanusi, who has been governor of the Central Bank of Nigeria since 2009, writing in the Financial Times, said: "Africans need to wake up to the realities of their romance with China." Referring to Nigeria, he says: "China takes our primary goods and sells us manufactured ones." Which is essentially an essence of colonialism, he adds. This is clearly an arrangement that needs re-evaluating and change could go someway into making mining fairer in Africa. For Western companies who choose to process its minerals else where, Shapiro says: "Certainly it is a question of both facilities and infrastructure. Some of the processing plants are very expensive and out of reach for poorer countries. "Of course as beneficiation is an added value; there is reluctance for the importing country to give up this benefit." It is certainly a pivotal time for change in Africa. While evolving the management of its resource wealth looks complicated, there is certainly increased optimism. Issues such as transparency, accountability and how to combat tax avoidance are now being discussed by global leaders at events such as the G8. It’s also important to remember that the mining industry can not alone transform the development of Africa. Baissac, in his Forbes article, says that reliance on resource rent is an unsafe economic strategy. In 2009, when growth collapsed following the global economic climate, rent tumbled and Africa’s resource rich countries saw their growth perform worse than regions that are resource poor, he says. Although a vital source of wealth for Africa there is a need to focus on other areas, like infrastructure development, as well. Nevertheless, change is desperately needed for both Africans and foreign investors and when considering its implementation it’s perhaps important to remember Annan’s words: "Mutually beneficial agreements are the only ones that will stand the test of time. We all stand to win from an Africa that is truly prosperous, stable and fair." When nomadic miners working in the Sahara Desert encountered gravestones at their gold mining operation, an Islamic ruling put production on hold.